The M1 motorway was shut along a 10-mile (16-kilometer) stretch near Milton Keynes, 50 miles (80 kilometers) north of London, after the object was found under a bridge at around 7:30 a.m., Thames Valley Police said. Photographs on social media showed people playing Frisbee and kicking a soccer ball on the empty road. “There’s a five-a-side football competition, a bit of rugby, a guy cycling up and down in the wrong direction,” said Tim Mayer, who was caught up in the delay. Seven hours after the object was found, police said the bomb-disposal squad had determined it contained “no explosive element” and appeared to be “some form of chemical.” The road remained closed, and tests were being carried out to determine what the chemical was. 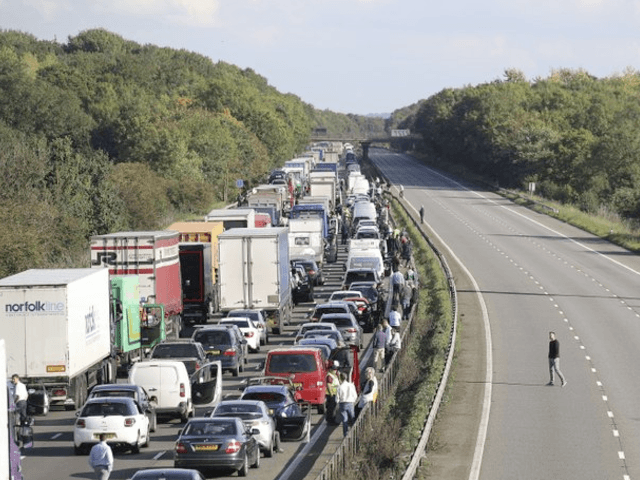 Highways England said it was “working as quickly and safely as we are able” to free vehicles from the closed-off area.